If you have ever wondered how life has changed over the last decade in the poverty stricken areas of the Ozark Mountains in Missouri, Winter’s Bone will answer your query and then-some. Words that come to mind to describe this film are; powerful, moving, educational, shocking and most importantly, inspirational. All of the ingredients are present for this winner of a film to create Oscar buzz as well. It’s already snatched two awards at this year’s 2010 Sundance Film Festival including the Grand Jury Prize, Best Dramatic and the Waldo Salt Best Screenwriting Award. 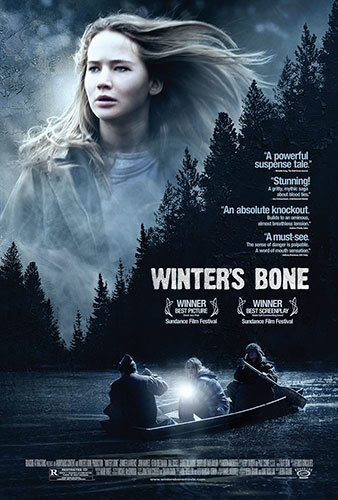 Based on the novel by Daniel Woodrell of the same name, Winter’s Bone is directed by Debra Granik with the screenplay adapted by Granik and Anne Roselini. Jennifer Lawrence stars as 17-year-old Ree Dolly, the oldest child in a family including a younger brother and sister. Her Uncle is named Teardrop and played amazingly by John Hawkes, a Dennis Hopper look alike. Dale Dickey gives a stirring performance as the deeply rooted mountain woman Merab; she’s one lady you do not want mess with! From the beginning of the film, the dismal landscape of rusted out cars and trucks cluttering front yards to the porches with broken steps and cracked windows, you know that you’re in a poverty stricken area. Most of the homes are in dire need of new coats of paint and repairs of broken screens, windows and doors. Esthetics have been long overlooked in the hill country as no one seems to have the desire to take pride in their surroundings. Certainly, one wonders what cards these people have been dealt in life to warrant such conditions. The film does show us that the majority of ‘hill folk’ are on meth, cocaine or other kinds of drugs. Moonshine seems to be the crutch of the past and meth the new go-to drug to numb the pain of poverty. Ree Dolly knows the consequences that drugs bring to a family as her own dad, a meth lab producer has put up the family home as collateral, in case he decides to jump bail. The film opens with the local sheriff’s deputy at the Dolly home informing Ree that her Dad has indeed skipped town and that if he isn’t found in a week the family property will be sold to the highest bidder. Of course proof of death is also another way out of this mess. The deputy doesn’t bother dealing with Ree’s mother because everyone knows that she ‘isn’t all there.’ Maybe she consumed too much meth or maybe the reality of her conditions put her over the brink. Regardless, Ree is the responsible one in the Dolly family and she takes it upon herself to try and find her missing father. She starts out in earnest and is met with closed mouth resistance as a ‘code of silence’ is set into motion, making Ree’s quest overwhelming. A determined Ree does not take no for an answer, however. She knows that people aren’t telling her the truth and she continues onward until finally Uncle Teardrop (a very frightening guy) decides to help her. John Hawkes gives a riveting performance as both an addict and a man who makes the choice to help his niece, even at the cost of his own life. Kin is kin as they say in the hills and Teardrop is exactly the type of kin you’d want on your side when the going gets tough. What’s incredible about the film is the fact that every time Ree shows up at a neighbor’s place while searching for her dad, someone usually offers her drugs. No one will help her with her main problem, but drugs to most folks are the answer to the problem. Ree always declines, and isn’t shocked in the least, as this is life in the hills of the Ozark Mountains. What does surprise her is the resistance of neighbors to offer any help other than giving her drugs. If she doesn’t find out about her dad, she and the kids will be thrown out into the forest or perhaps be divided up and sent to live with different families. We also see plenty of hill folk life as Ree teaches her 10-year-old brother and 5-year-old sister how to shoot a squirrel with a rifle. Ree also teaches her siblings how to skin the squirrel and cook it for supper. (You may never look at these cutesy little critters the same again)! In a poignant-somewhat artsy scene, a squirrel is shown in his tree home looking wide-eyed and frightened as the sound of a chainsaw roars in the background. A striking subliminal message as the squirrel is about to lose its home and directs our attention back to Ree, which heightens the urgency of her situation. Does Ree find her father? Do the hill folk ever help? What becomes of the Dolly family? All of these questions are answered in due time, but the message here is how in the world did Ree Dolly have the gumption to stand up to all of these people and continue her quest? Winter’s Bone is a haunting film of life in America, one that depicts meth as the replacement for moonshine. Ree’s character does offer hope but much more is needed, as the children are the ones suffering here.